Every blogger trying to find some post ideas in his daily life, but the result is they won’t get any post ideas even after spending a lot of time. So today I’m going to show how we can get unlimited post ideas for free without spending anytime and staying in your own blog!. 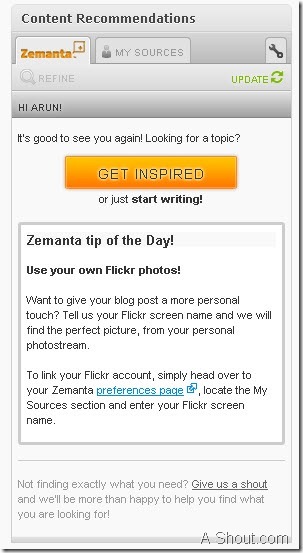 When I was browsing I came to know a simply amazing site called zemanta and I see they are providing powerful addon for blogging purpose. I don’t read further about that add-on and just installed on my Firefox browser, after a while when I went to write post on my blog I just see one extra tab called “Content Recommendations” in left side. I don’t give much importance when I see it first, after I started writing post, I surprised to see related post or content recommendations from the web, after seeing I just amazed for a few minutes. Because it gives more related post when you start writing, not only it provides post ideas to your blog, but also provides related images that you can use it on your blog. Looking for content writing ideas? : If are one who looking for content writing ideas or post ideas to post it on your blog then this is must have addon for you. 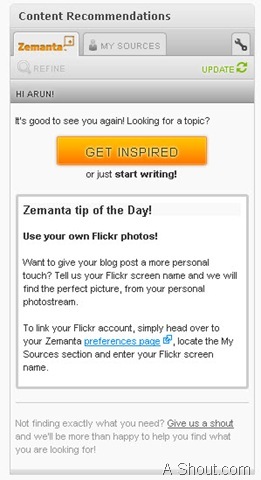 Because when start writing any post that you’re interested, zemanta show post related to that topic collected across the web, so can get ideas what are able to write. 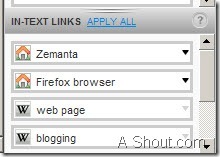 Linking appropriate text: Think you have used some scientist name in your post, if you interested in linking the web page containing more about that scientist, then zemanta provides more about that scientist in “IN-TEXT LINKS” tab. They provide link pointing to Wikipedia and some other good source. So you’re not supposed to Google to link more about that scientist. Need appropriate images? : Zemanta provides appropriate images with the giving proper credits to the original source, So you are not about to bother about the Copyright. My thoughts: The above are the some notable points on zemanta, there are lots more you get when you start using it which I have not shared in this post. To be frank I’m happy after using this addon. Want to install? 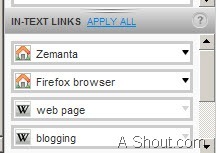 then visit to official zemanta download page and select the option where you would like to install. They are providing lot’s of option to use it. Do know about Zemanta already? what are the different ways you collect post ideas? What do you feel about zemata? share with us. this is a nice tool specially for me who sometimes at lost on what to post next. You’re welcome Eric, hope you enjoy that addon. Really a nice addon for bloggers. Thanks a lot downloading it right now! Himanshu, I think it is better to use in the add-on format itself because If we started adding more and more number of plugins, then it directly affect on our blog loading speed. Thanks for this awesome tool. Till now i did it manually. Wow good idea, grabbing right now. I heard about this site long a go but never try it as my source for blogging idea, thank to remind me bro. I was using Zemanta some time back but from last few months I stopped using it. I don’t have any reason for the same, but after looking at your post, I think I should give it a shot again. Defiantly every blogger need have his, because it gives such a cool suggestion related to what we are writing the post and even provides images by providing credit to original source so we don’t need to search images manually. Personally, like this plugin most. Sharing is caring.Thanks for sharing this awesome and useful plugin.I think this is must for every blogger. thanxx for sharing this post. Thanku Arun , it is going to help me lot. There was a time when I was using Zemanta, but then I quit using it. After reading your article I think I should give it a try again and see if they have improved their system.